These coconut flour brownies are super fudgy and are also paleo, grain-free and dairy-free! Topped with chocolate fudge frosting. Scroll to the bottom of the post for a how-to recipe video. I keep getting questions about how to make this and that recipe with just coconut flour and not a blend of almond flour and coconut flour, which is what I usually use, like in these paleo carrot muffins or paleo peanut butter cookies. I’m not usually a fan of treats with just coconut flour. The often have a weird, eggy texture and not-so-awesome taste (at least in my opinion), so I have very few recipes that call for just coconut flour. These coconut flour brownies are an exception! They’re every bit as delicious as traditional brownies. 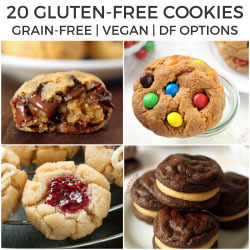 People won’t even know that these are gluten-free, much less made with just coconut flour. Same with these chocolate chip coconut flour cookies! They taste exactly like regular chocolate chip cookies. I also experimented with making these brownies vegan. That didn’t work out at all. Do not try using egg replacer in these! At least not chia or flax eggs. They came out so greasy! I’ve been playing around with this coconut flour version for about a year and one thing is super clear – the order in which you add the ingredients is really important! If you don’t do it the way it’s written, the wet and dry ingredients don’t really combine well and the result is oily. These coconut flour brownies are also paleo (if you leave out the sprinkles)! And the most delicious paleo brownies I’ve ever had. They’re a bit heavy on the sugar (though not compared to a traditional brownie recipe), but they are brownies so I’m not going to beat myself up over it. And they’re also nut-free. Something that’s not all that common with paleo desserts! I love my almond flour and nut butters but don’t miss them at all in these brownies. Like the original gluten-free brownie recipe, these are also dairy-free. Though if you want to use butter in place of the coconut oil, I’m pretty sure you can! They’ll just be a tiny bit less fudgy. And these are incredibly fudgy so a tiny bit less gooey is no big deal. By the way, I’m working on an all coconut flour version of my chocolate chip paleo cookies! And they’re amazing. Can’t wait to share! I’ve answered most sub questions in the post above but here it is again for easy reference! Can I omit the eggs / use an egg replacement? I tried with chia and flax eggs and they were a complete disaster. I don’t recommend trying that or any egg replacer. And definitely don’t just omit the eggs. Can I use another type of flour? You can! Go check out my gluten-free brownies recipe for instructions on how to make them with teff, buckwheat, or whole wheat flour. Can I use something else in place of the coconut sugar? You can use granulated sugar (which means they’re no longer paleo). Liquid sweetener won’t work. I also have no idea how to make these low-carb. Wondering what else to do with coconut flour? Try these coconut flour chocolate pancakes from Pint Sized Baker! In a medium mixing bowl, stir together the sugar, flour, cocoa powder, and salt. Set aside. In a large mixing bowl, stir together the melted coconut oil, vanilla extract and eggs. Stir until combined. Add the dry mixture to the wet and stir until combined. Do not overmix! The mixture will be more of a batter than what you see in the video. Pour the batter into the prepared pan and bake for 16-20 minutes or until the brownies appear set in the middle. It'll have the appearance of cake. They won't be gooey and wet, but shouldn't be dry like cake, either. The brownies will continue to bake as they sit in the pan and will firm up as they cool. These brownies don't have the best texture straight out of the oven, when they're quite cakey. They need to cool for the best texture. Let the brownies cool completely, about 60-90 minutes, and then prepare the frosting. In a small saucepan over medium-low heat, mix together all the ingredients. Stir until melted and completely smooth. Let cool for about 10-20 minutes or until no longer warm, but still pourable, and then pour over the brownies. Place the pan in the refrigerator and chill for 1-2 hours or until the frosting is firm (it should be hard enough to cut into squares without making a mess). The frosted brownies are fine at room temperature for 1 day. The frosting won't harden enough to stack the brownies, but it won't be as soft as the warm frosting is. Unfrosted brownies can also be kept at room temperature for a few days. Cut into 16 squares. 114 comments on “Coconut Flour Brownies (paleo and super fudgy! )” — Add one! what brand of coconut sugar do you use? The coconut sugar I have on hand made brownies taste like mocha which I liked but wasn’t a hit with my kids. I live in Germany so I have different brands here. But I’ve tried tons of brands and have never gotten a mocha taste! Very interesting (but I’m sorry your kids didn’t like it!). Will a regular all-purpose flour work on this recipe? It’s what I have in our pantry and no budget yet for a coconut flour. If so, how much all purpose flour? Sorry for just now seeing your question! Hopefully you found the answer in the substitution questions section of the post. Regular flour won’t work. I recommend finding a regular brownie recipe! Almost all of them use all-purpose flour. I was looking for a brownie recipe that I had all the ingredients for. I found this one. It was amazing. I am so thankful to have found it. It’s now my go to. My craving for brownies could not be silenced. I didn’t want to eat store bought junk. This recipe gave me the whole ingredients I like to use and the rich chocolate fudge like brownies I wanted. Soooooo delicious. Thank you for being awesome! And thank you for leaving a super awesome comment! ;) I’m so glad that you enjoyed them and that your cravings can now be dealt with in a not so junky way. :D Thanks for your comment and sorry for my slow reply! I made these over the weekend. They were fantastic! Thanks for the great chocolaty indulgence. I enjoyed these so much I am going to have to replace the sugar with a low carb sweetener so I can eat them more often. I’m really glad to hear that! I’d love to know what sugar sub you use. :) Thanks as always for your feedback! Ok, so I tried these with a low carb sweetener. I used something called Super Sweet which is a mixture of erythritol and stevia. I don’t know if you have ever heard of a diet plan called Trim Healthy Mama. It is their blend of sweetener and I think I need to use what they call Gentle Sweet. These brownies were weird made with Super Sweet. When I first removed them from the oven there was oil pooled on top of them. I thought…I’m going to have to throw these away but then the oil soaked back into them. They were on the dry side but I still ate them with a bit of low carb ice cream. I will try again at some point with hopefully gentle sweet. Come to think of it though it might not have totally been the Super Sweet blends problem. I used half butter and half coconut oil. Could that be an issue? I use unrefined coconut oil and I was trying to cover up a little bit of that coconut oil flavor. The measurements in grams for the cocoa powder and the coconut oil are WAY off. 196 grams of melted coconut oil is way more than a cup of oil. Same with the cocoa powder – 86 grams is way more than 3/4 cups. It was not just a small difference, it was WAY too much. Damn shame too because this was the first time I decided to weight ingredients on a scale rather than using cups and it was a total fail. No, they’re not. I make these brownies at least once a month using grams and they’re always great. You can google or look at the back of your product packages to see how much cocoa powder and coconut oil weigh and you’ll see that the listed grams are correct. I’ve been posting recipes for 7 years using grams and cups and you’re the second person to say my grams are off. So I recommend that you make sure that your scale isn’t off, that you didn’t use a wrong setting, etc. Also, I see that you have reply notification on but I got an email returned from Google saying that your email address is invalid. In case you wonder why you didn’t get a notification. Hi! This looks fantastic. Do you think I could use monk fruit sugar instead of coconut sugar in this? Thanks for your recipe…. I don’t follow recipies (ever) but I did use it as a guide. I subbed in peanut butter for some of the oil and added walnuts (nut free obviously not an issue here) and they turned out great. Thanks again. You’re welcome! I’m happy that your subs worked out well and that you enjoyed them. :) Thanks for your comment! Can the cocoa powder be substituted with Cacao powder? Hi! I try and follow a paleo regimen, but I use regular vegetable oil, or olive oil, as I don’t much care for the taste of coconut oil – and its abundantly used here in India, particularly the south. Could I sub the coconut oil in this (brownies and the frosting) with regular vegetable oil? Will the frosting taste odd if I do? Thank you! Hi there! Sorry for just now seeing your question. I don’t think that regular vegetable oil would work in the frosting but I think olive oil might work in the brownies. But you’ll want to keep them chilled! Sorry I can’t give you a better answer. I’d love to hear the results if you give it a try! I think I just did the cold eggs and coconut oil mistake as mine is as thick as dough. I’m keeping my fingers crossed and am gonna bake it to see how it turns out. Oh well, live and learn! They’re great without frosting! I made them that way and brought them to a BBQ yesterday and everyone loved them. :) You can also use canned coconut milk and mix it with water so that it’s about as thin as regular milk. So maybe 1/4 coconut milk and 3/4 water? I’ve been doing that recently. I’d love to how hear they come out! I just wanted to know whether i can use unsweetened cocoa powder . Hi, just made these for school lunchbox. Are the freezeable if unfrosted? Definitely! Also freezable if frosted. Hope your kids liked the brownies! 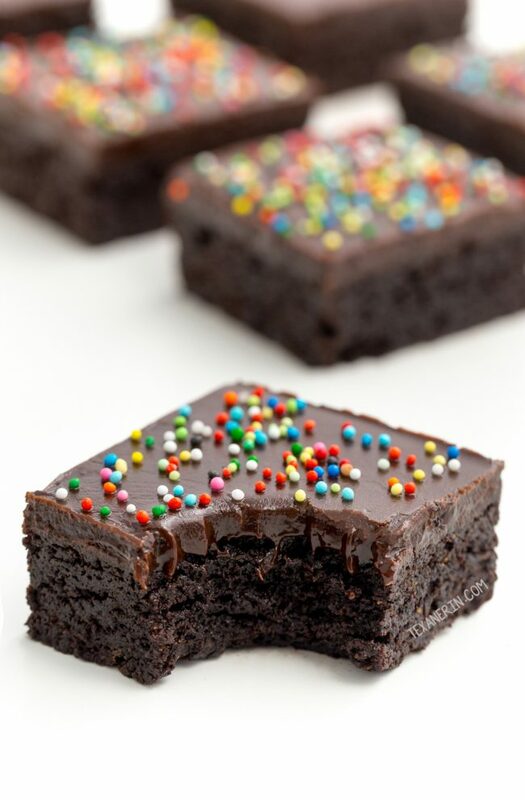 I tried these brownies and they turned out AMAZING! They were delicious and everyone I shared them with enjoyed them as well. I was wondering if there is any way to make them low carb? Yay! So happy you liked them. 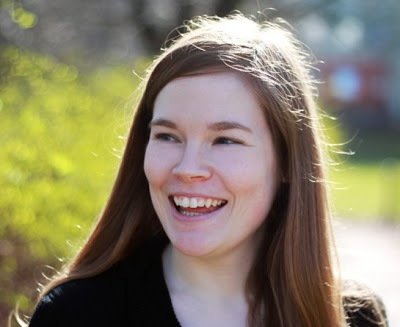 :) But like I say in the post – no idea how to make them low-carb. Sorry about that! A few of the commenters said how they did it, but I haven’t tried it myself. Hi Erin, can I use Swerve in place of sugar? Hi Marcia! Sorry, but I still have no idea. Swerve is a direct sugar replacement so 1 cup sugar = 1 cup swerve, so there shouldn’t be an issue. Hello there! I was wondering if I can sub the chocolate in the frosting for cacao powder? Hi! Unfortunately not because the chocolate contains fat, which firms up the frosting, and 100% of the sweetener in the recipe. Cocoa powder + milk + coconut oil wouldn’t be very tasty, either. Sorry about that! I love this recipe! I actually made a variation that is super tasty. I follow everything except I cut the sugar to 1 cup, add 5 eggs instead of 3 and add a 1/2 cup pumpkin purée and some chocolate chips. It’s such a moist cake! Kind of like a moist birthday cake. I top it with a frosting whipped up consisting of coconut butter, ghee or coconut oil, vanilla, honey, and salt. Garnish with toasted chopped pecans. I know it’s quite different than the recipe but I just had to share. I would’ve never discovered this awesome cake I make unless I had this recipe as a skeleton format. Thanks Erin! You’re welcome! I’m so happy that it was a good base for your creation. :) It sounds wonderful! I’ll have to try it myself. Do you taste the pumpkin at all? Do you remember the baking time? Thanks again! Since I’ve made it a few more times I find that 6 instead of 5 eggs makes for a more moister batter, and 1 cup of pumpkin instead of 3/4 cup. I bake it at 350 for about 40-45 minutes. After it’s been in the oven for 25 min, I check it every 10 minutes thereafter. Oh, wow. You must really like it! I can’t wait to give it a try. :) Thanks a ton for coming back to share the change with the eggs and the baking time! Hope you have a great weekend. I just made these brownies and let me say they look and taste like regular brownies. I paired them with my oreo cool whip and it was like having an Oreo brownie ice cream dessert. Thanks for the recipe. I made these with a half cup of swerve instead of coconut sugar for low carb and i put sliced almonds on top before baking. I do not like sweet sweet and I eat low carb. they are delicious with my subs. I had a warm one with almond milk! perfect snack to eat while my kids are eating ice cream😜. So 1/2 cup of Swerve instead of 1 1/3 cups of coconut sugar? That’s great! Thanks so much for the tip. I have some Swerve so I’ll give it a try, too. :) Can’t wait! Thanks again. My friend is allergic to chocolate – can I use carob powder and chips instead. Would there be any change in directions, if I did? Sorry for just now seeing your comment! I just googled it and while many sites said that they’re interchangeable, that hasn’t been my experience. I’ve only tried it in maybe 4-5 recipes instead of cocoa, but it didn’t go well. I think the first reply here is helpful. Sorry I don’t have a better answer for you! These look absolutely amazing!!! I’m going to make them tomorrow. :) Can I use honey instead of the coconut sugar? Just had to touch base. I’ve made this twice now and The first time I actually used raw honey. They came out fantastic. But I do agree, liquid honey probably wouldn’t work. Awesome! So happy to hear that. :) Thanks for the feedback! I want to make them today. I just want to know can i use unsweetened cocoa powder instead of dutch processed. These are super amazing! And I have been looking for something sweet that is paleo, but nut free (can’t send nuts to school). I used half coconut and half ghee(whoops!Didn’t realize I was almost out of coconut oil until after I had started) and it was fine. Except now I am almost out of ghee and it is spendy- oh well. Time to go shopping. It’s great to know that half ghee and half coconut oil work well! Thanks for the tip. I actually never used ghee in baking for that same reason – it’s so expensive! Unless I want to get a huge bucket of who-knows-what quality from my local Asian food shop. I’m happy that you enjoyed the brownies! I have another recipe that might work for sending to school. You can use sunflower seed butter in these coconut flour cookies for another nut-free paleo treat. :) Thanks for your comment! Can’t wait to try this recipe! But wanted to comment for the Ghee- it is super easy to make at home! Just take blocks of unsalted or salted (your preference) and boil it, until the milk solids separate, and the liquid becomes golden. Let it cool, and strain into a glass container. Nothing wrong with going off grid. ;) Your changes sound great! I’ll have to try that, too. Thanks so much for your feedback! I’m happy to hear that you liked them. I was wondering if i could make these in muffin pan so that it gets easier for toddlers to take to school? Yay! I’m so happy that they came out well in a muffin tin. Thanks for coming back to share the yield + baking time! I’ll try them, too. :) Thanks again! 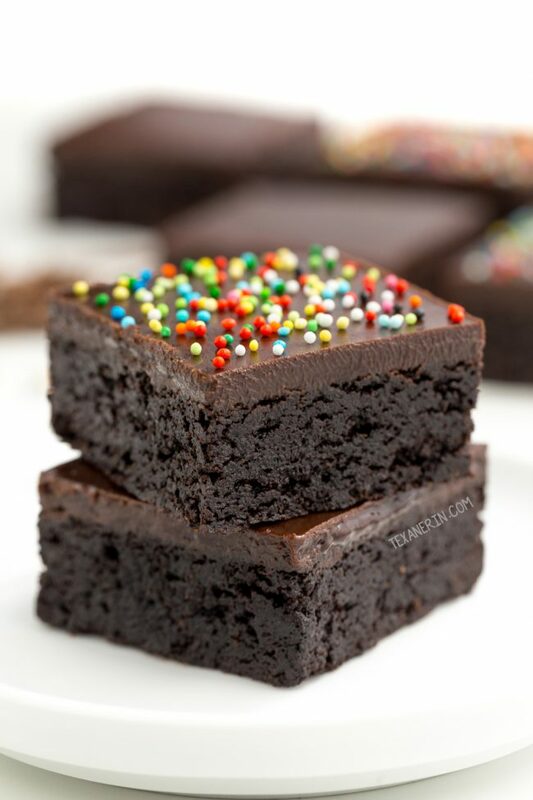 These brownies are amazing!! I love the fact that the outside is just a bit crunchy while the inside is rich and moist. I used butter as I just finished my coconut oil and was a bit worried that it won’t work. This is the second recipe I’m trying with coconut flour, the first one being baked doughnuts, and by far this is the best one. I was expecting something “healthy” and with a so-so taste, but this has exceeded all my expectations. I now have a new favourite recipe. Aww, yay! So happy that they exceeded your expectations. :) I’m usually not a fan of recipes just using coconut flour. They almost always have a terrible texture! So I was also super surprised that these came out so well. If you need some more recipes that use coconut flour, I’ve got a bunch here – coconut flour recipes. Thanks so much for your feedback! Oh, no. :( I’m sorry about that! I guess all stoves are different. I first tried the frosting at low heat but it just took forever. Did you stir constantly until the chocolate was melted? I’ve never had that issue. I hope the brownies were still enjoyable with the frosting! Just made these for Valentines Day. I added chopped walnuts. I am going to cut them and pour the warmed frosting over each square (we like ours warm) and then add fresh berries. I had to try one first…oh my goodness it was so good. Moist and chewy and chocolatey. Doesn’t get any better than that; great recipe!!! Can I replace the eggs for apple sauce? Great recipe for a treat! They turned out delicious… My children were simply delighted to have brownies that they could eat… Nut free, dairy free, and made with coconut sugar! I think it is important to weigh the ingredients! You’re welcome! I’m thrilled to hear that your kids enjoyed the brownies. :) I usually use a mix of almond flour + coconut flour but I’m working on coming up with some more all coconut flour treats since it seems like so many people are nut-free. Thanks for your comment! Hi Erin! I accidentally put too much coconut flour first go round. Followed the recipe exactly this morning and the btet was still quite thick. When you say it shouldn’t be as thick as the video, did you add more coconut oil or egg (or both)? Side note, I used splenda to help make it lower carb, though I’m not sure that had anything to do with the thickness. Thanks! That should have read the batter is still quite thick sorry. Typing on my phone. Hi Golda! The batter should be pourable (sorry that this isn’t what you see in the video! Total mess-up on my part). Was yours pourable? If not, I wonder if you’re packing your cups of coconut flour. Do you have a scale? If so, I really recommend using it. That could be the difference! I’ve never used Splenda but when I have tried other low-carb sweeteners in my recipes in the past, it totally messed with the texture. I’m not saying that’s the issue but it could be. My bet, though, is a little too much coconut flour. Made these with 30g less sugar, butter instead of oil and no salt as the butter was salted. They are amazing, so so good!!! I may have missed it, but didn’t see any carb information on this recipe…have I overlooked it? No, sorry. Like I said in the post, I have no idea how to make these low-carb. Sorry about that! Kim, with this little coconut flour, I used splenda instead of coconut sugar and the whole thing is fairly low carb before the frosting. If you can find low cab chocolate that will melt and use heavy cream, that will make the frosting low carb, as well. The whole family loved them they are very rich in flavor. I was surprised it was so moist with just using coconut flour. I highly recommend giving these a try. Those are some seriously amazing brownies! You can never go wrong with a chocolate treat and these look out of this world YUMMY!!! Oh my gosh! These are just what I need after Monday! 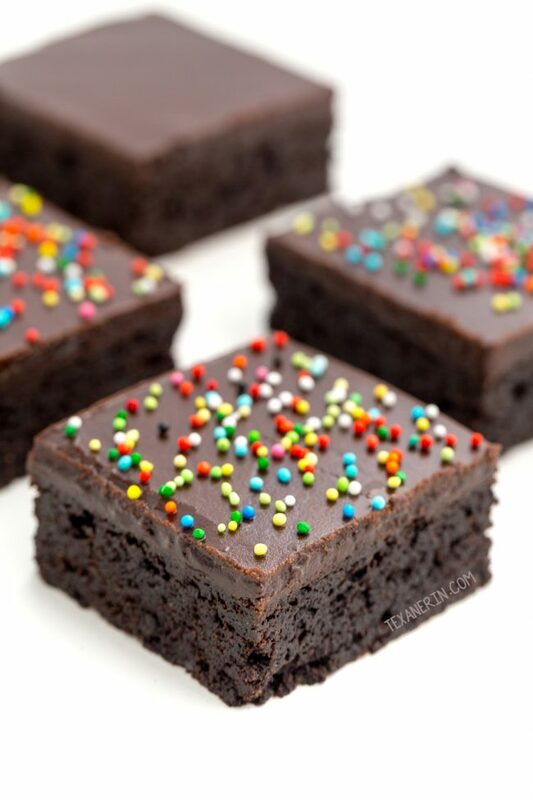 Oh my goodness, these brownies look absolutely amazing!! SO rich and fudgy!! making these today.v Glad you corrected the recipe before I did. These brownies look delicious! I have coconut flour lying around my kitchen and was wondering what to make with it – so this is what :) Thanks for a lovely recipe! Can we use butter instead of the coconut oil? I’m thrilled to have a grain-free recipe for brownies. Been having fun with coconut flour. Coconut oil…not so much. Thanks! Hi there! Check out the bit after the second photo. ;) Hope you’ll enjoy them! I’d love to hear how they come out for you. When I clicked on the video on it said there was an error. I tried twice but never could see it. Did you try from the newsletter? Because it doesn’t work from there. You unfortunately have to come to the blog post to view it. I just checked and it’s working so hopefully it works for everyone. :) Thanks for letting me know! I will definitely be trying these sometime this week. Always looking for new ways to use coconut flour. I’ll let you know how they are. I love your gf/df brownies made with buckwheat. Awesome! I’m excited to hear how you like them. I know (or at least think) you also go by weight when measuring ingredients so please read the email I just sent to the newsletter subscribers about the coconut flour weight. Sorry again about that! I don’t go by weight. I know I should but I don’t even have a scale in my kitchen. My kitchen isn’t big enough. But thanks for the heads up. I meant to say in my reply that your little boy is adorable. I have 3 little boys…boys are the best! I’m all for cups as long as people measure stuff correctly and don’t totally pack their cups full with flour. :) And thank you! He’s definitely a fun little guy. So timely! I accidentally bought a bag of coconut flour (which I already had) when I meant to get almond flour (which I had not), and I’ve been wondering how to use it, since my go-to recipes typically call for only a small amount of the former. Looking forward to trying it out the next time we need a sweet treat. Oh, yay! I’m happy to have helped you solve the problem of having too much coconut flour. :) I also usually use a super small amount of almond flour as well. All coconut flour based desserts are definitely funky most of the time. ;) And since I think you also saw this post through the newsletter, please read the email with the correction I sent before making the brownies! I got a gram measurement wrong (sorry! ).